Paramedic students at the Justice Institute of British Columbia (JIBC) will have greater opportunities to help youth and seniors in Victoria thanks to the generous support of TELUS. 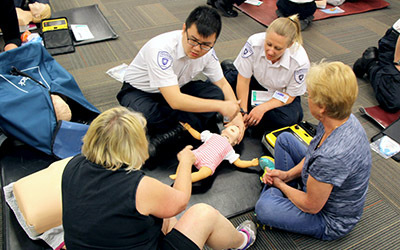 JIBC has received an $8,500 grant from the TELUS Victoria Community Board to help purchase much needed training simulation equipment, such as resuscitation dolls and Automated External Defibrillators (AEDs). With this funding, JIBC paramedic students on Vancouver Island will have an enhanced ability to develop their skills in class, and also contribute to the community’s health, safety and wellbeing by teaching essential lifesaving skills through a number of student-led community health workshops for youth and seniors. Participants in these workshops will have the opportunity to assess and manage basic life-threatening medical emergencies, and learn how to perform cardiopulmonary resuscitation (CPR) and use an AED. JIBC’s Paramedic Academy trains 1,000 Emergency Medical Responders and approximately 200 Primary Care Paramedic (PCP) students each year throughout the province. As leaders in justice and public safety, JIBC students are regularly supporting community initiatives, events and fundraisers as ambassadors and first responder attendants. Recent examples include football tournaments, community health demonstrations for seniors and youth, charity golf tournaments, donor appreciation events, and charity marathons. Jill Howard, TELUS Victoria Community Board Member, and Kathy Baan, Senior Manager, Community Investment, Vancouver Island, were on hand at the Victoria Campus on June 15, 2016 to see firsthand how their gift is making a difference. Alongside 13 retirees, both were treated to an exclusive learning session with PCP students and the opportunity to practice lifesaving skills. 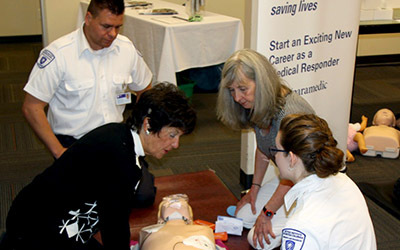 Joan Wall (right), participating in a community session practicing lifesaving skills delivered by JIBC Primary Care Paramedic students at the Victoria Campus. In staying true to the company’s philosophy “give where we live”, TELUS, team members and retirees have contributed more than $135 million and 3.76 million volunteer hours to charitable and community organizations throughout British Columbia since 2000. TELUS has 15 local community boards dedicated to supporting local projects. The three Community Boards in B.C. have donated more than $12.9 million in support of nearly 1,500 local charitable projects since inception, in partnership with regional TELUS Community Action Teams.